Experiment #58 was conducted by Chef Juan Manuel Barrientos a/k/a Juanma at his third El Cielo restaurant located in downtown Miami. This is his first restaurant in the United States with the first two located in his home country of Colombia. Three restaurants in two countries is an impressive accomplishment for a 31 year old. He attended culinary school in Argentina followed by two years of cooking in Spain including a stage at Arzak in San Sebastian. He opened his first El Cielo in Medellín in 2007 followed by Bogotá in 2011 and Miami in 2015. El Cielo Bogotá was named one of the Latin America's 50 Best Restaurants in 2013 & 2014 by the well regarded S. Pellegrino & Aqua Panna World's 50 Best Restaurants . This year he impressively climbed to 30. He is a creative, innovative and artistic chef who is passionate about his food. His restaurants are tasting menu only which he calls The Trip. During that trip he attempts to stimulate your senses which includes getting your hands dirty with his staple, chocotherapy. But he doesn't let his modern cuisine and artistic flare overshadow the flavors of his food. Those aspects along with his experimental nature put him on the Cobaya radar. Juanma was into the "underground" aspect of Cobaya and had a cool plan that didn't come to fruition. But he pivoted to his plan B and had the 40 hungry guinea pigs meet at a nearby wine and cheese shop that serves sandwiches and coffee too called Bon Fromage. There guests were served a glass of prosecco along with a small sandwich bite. Once done, Juanma revealed the final destination. There will always be some misses with this type of cuisine but if you go with an open mind you should enjoy the ride Trip. 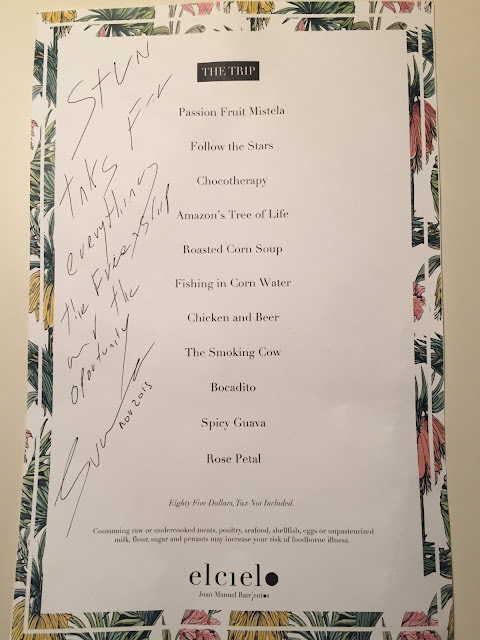 Big thanks to Chef Juanma for opening his restaurant for us on a Sunday night and his entire kitchen crew for a fun, creative and tasty night. And thanks to his skeleton team in the front of the house for serving several courses in an impressive fashion. And big thanks to all the guinea pigs out there for your continued interest and support. See you at #59. Oompa Loompas hard at work. Follow the Stars. Unfortunately, I missed this dish while I was escorting people inside. I'm not sure what it was but it looked good. Amazon's Tree of Life prep station. Amazon's Tree of Life. An edible and delicious tree. The chewy flatbread is made with yuca and cheese and paired with an even better spicy coconut dipping sauce topped with squid ink powder. Roasted Corn Soup. Juanma's creamy and flavorful riff on an arepa was a highlight of the night. Fishing in Corn Water. The fish, salmon, was a bit overcooked for me but the accompanying broth made up for it. Chicken and Beer - I didn't take any notes and I don't recall exactly what was going on here. Nevertheless, I do recall wanting to lick the green stuff off the plate. And I think I did. Guinea Pigs excited for the arrival of The Smoking Cow. The Smoking Cow - Sushi style steak. Sold! Spicy Guava - Cayenne pepper for dessert is always an interesting twist.